I've waited 10 years to plant hydrangea bushes. It didn't seem like a wise investment when we were remodeling and moving every couple of years. Above, mulching the bed with recycled newspapers and free leaf mold. I hope to stretch the initial cost by giving lots of hydrangea bouquets and propagating cuttings. Despite the sweat and dirt, this ranked as one of my happiest days all year. Delayed gratification can be a beautiful thing. Visit the Inspired Room for more ideas for authentic living. Meredith, I planted my first hydrangea this spring too, and hope to add more. My mom has grown them for years, and we have given lots of fresh bouquets. As well, I have made wreaths of dried ones-- cutting the flowers when slightly past prime, and putting them in a jar with an inch of water. I just then let the water evaporate, and they dry on the stem. I almost love the silvery green they fade too as much as the fresh colors. Good luck with yours-- they are some of my favorite flowers. Hydrangeas are also wonderful for wedding/shower/floral arrangements! And VERY easily propogated...you won't regret planting them. I don't understand the newspaper...does it make the ground Healthier??? Love hydrangeas. Don't have any in my yard but would love to. We place newspaper in our garden area around the plants and then throughout the summer place grass clippings on them. Works wonders for keeping the weeds out. We had a gorgeous hydrangea bush two houses ago :-) We too have moved too often, and in our last house I didn't plant much at all. This time, God willing, I am looking forward to having all the things I have loved and left behind at past houses...hydrangeas, peonies and other pretties! I used to love my hydrangeas and had beautiful bouquets all summer long. Then, when they dried out, I enjoyed them all winter! They will be a great investment for you! Hydrangeas are definately an investment. My husbands grandmother received some when her husband died 35 years ago. She planted them under her kitchen window and they are still going strong. Sandy Toes, newspaper works as a (free) degradable weed barrier. You have to put something on top to hide the headlines, but eventually all the layers break down and enrich the soil beneath. love hydrangeas, too! They are SO easy to propogate, and even the dead blossoms are pretty in the winter. I believe your zone grows the Oak Leaf Hydrangea very well (ours doesn't) which is a fabulous specimen. OH I love hydrangea's and I love how different soils will create different colors flowers. So fun. I planted my first hydrangea last year and I love it. I think it is a great investment that will produce lots of beautiful bouquets. I'm happy for you! One of the things that thrills me about our new living situation is the perennials that came with this rental, including a nice little hydrangea, and a whole bed of roses. They are a bit overgrown and ridding the bed of weeds is going to be a long-term project but for me there is nothing more luxurious than bouguets on my mantel and throughout the house. And all this time I've been waiting to hear about the next move since it seems way overdue. So, are you staying in your current home? And what other changes will you be making that you haven't done before because your housing was more temporary? I love hydrangea bushes. I have tried more than once to grow them here. It is just too hot. I hope that you have good luck with yours. Have you seen the site on lasagna gardening? It is amazing. 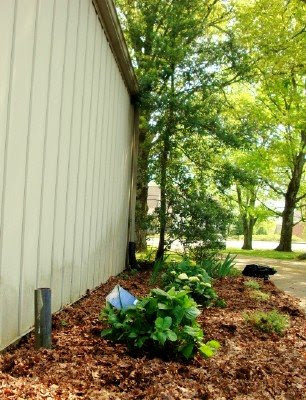 I have done that here with some crape myrtles and day lilies. Getting something to grow when it is over 100 for days at a time is not easy. Good luck with your new flower beds. They will be beautiful when they fill out. i've always wanted to grow hydrangeas. every time i bought one though, it'd die on me. i don't think they grow well here so i've given up. they are so beautiful when mixed with roses and other flowers. hope you have lots of luck with yours! ohh I love hydrangeas! They do make the most gorgeous arrangements! I hope you enjoy yours! I have dreamed of having a fig tree in my backyard. Every year I talk about buying one , but just talk . Today I purchased a small Fig Tree for $10. My absolute favorite. I look forward to my Hydrangea blooms every year. If you ever get the chance to visit Nantucket, MA, you will be truly inspired by the most beautiful Hydrangeas. The sea air and moisture off the ocean does wonders for them. They prefer a southern exposure and little pruning. BEAUTIFUL!!! I love hydrangeas and want to plant some but have put it off year after year due to remodeling. I'm hoping to take just do it soon. I can't wait to plant them at my country cottage. 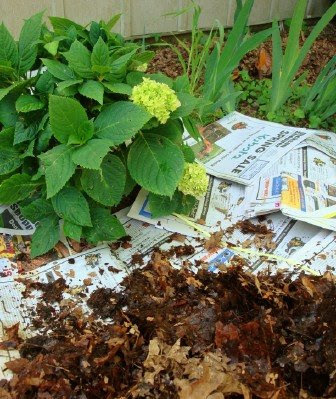 I have always used newspaper as a week barrier and then cover with leaves or mulch. Years ago I did my garden area this way and punched holes in the paper for the plants. Saves a lot of work, time and money. They are going to be stunning!! Hydrangeas are easily rooted. I definitely cut the leaves, but I dont do the rest of what that website recommends. After i cut the leaves and remove all the rest of the leaves beneath them, I cut the stem on a long angle and put them in water. I change it every couple of days, and in about 2 months or so, I have roots! I keep them in a small planter for a while, then harden them off on the porch, and a few weeks later they go into the ground. Its fun to do over the winter. what a wonderful mother's day gift to yourself! we planted all day and worked in the garden. happy mother's day, meredith! you are a fantastic MOTHER. i know, because i witnessed it! HUGS! I planted my first hydrangeas this year! I can't wait til they bloom! I can't wait to be somewhere permanent so I can plant hydrangeas again! Enjoy yours! Hi Meredith, Hydrangeas are my FAVORITE and they are soooooo easy to propagate. I did almost a whole fence line with hydrangeas I propagated. They're beautiful but they're also such a versatile plant. They look great fresh or dried. I'm thrilled for you and I know you'll really enjoy them!